The amenities include on-site dining free Wi-Fi and complimentary airport transit at the non-smoking Crowne Plaza JFK Airport New York City. Free Wi-Fi flat-panel HDTVs coffeemakers and mini-fridges are included in all 330 rooms at the nine-story Crowne Plaza. Guests have 24-hour access to fitness and business centers. The in-house restaurant serves breakfast lunch and dinner and it also offers limited room service. Cocktails are mixed in the lounge. As for anytime snacks there's a 24-hour pantry on-site. Guests enjoy concierge services plus free on-site parking and complimentary airport shuttle service. 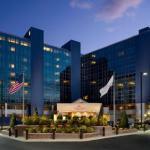 The Crowne Plaza is off I-678 within two miles of John F. Kennedy International Airport. Head 12 miles west to stroll the bustling avenues of New York City. Guests test their luck three miles away at the Aqueduct Racetrack.